Story by staff writer Lisa A. White. Photos Copyright © Lisa A. White. WHEN WE DECIDED to zoom straight from Lima, through Cusco, and on to the town of Ollantaytambo without an overnight stop, Dan and I were not thinking about the various altitudes. As it turns out, we were extremely lucky. This particular path (with no overnight or extended stays along the way) made the altitude changes manageable. According to the CDC, the primary problem that people have with altitude sickness, called soroche, is when they transition too quickly between lower and higher altitudes. 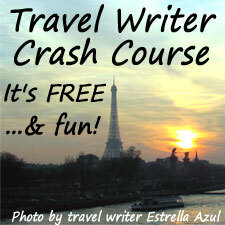 For context, to travel to Machu Picchu by plane, almost everyone arrives in Lima then flies to Cusco. 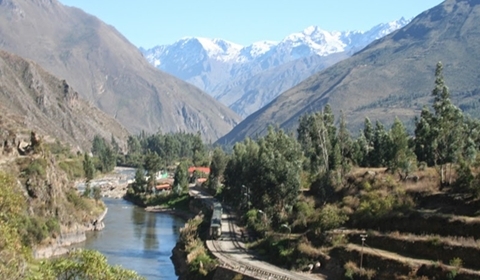 Most people travel by car or bus from Cusco to Ollantaytambo, then by train to Aguas Calientes, then take a bus up to Machu Picchu. There are also trekking versions of this route, but regardless, the trip takes quite a bit of planning. Our route? 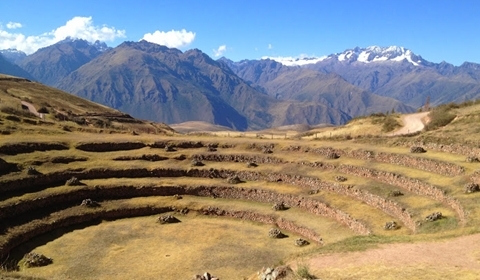 We flew into Lima, then immediately flew to Cusco, then took a cab from the airport directly to Ollantaytambo. Our first full day was spent hiking around Ollantaytambo. The second day we rode horses to the Sun Gate or Inti Punku (there are several “sun gates”). The third full day we had pre-purchased tickets and went to Machu Picchu. The fourth day, we hiked up the temple ruins in Ollantaytambo. By day five, we should have been well-acclimated to the high altitudes, right? Not so fast! 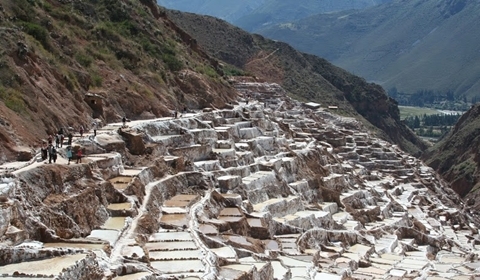 On that day we hired a driver and went first to Salineras de Maras (or the Salt Ponds of Maras). At various points along the way, our driver would point out the salt ponds in the high valley in the distance. Eventually, we ended up on a road just above the salt ponds—we had no idea they were so extensive! 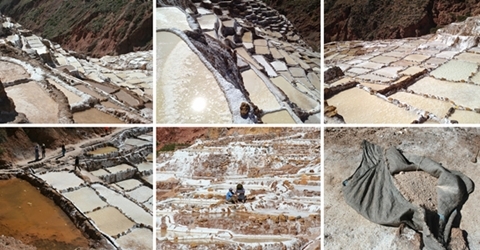 These salt ponds are pre-Incan and each pond is worked by a specific family. A very small creek flows into the ponds, then is diverted to flow through the valley from the upper ponds to the lower ones. In a few, we saw people working, sometimes opening or stopping the flow of water, other times collecting the coarse salt. The varied colors and shapes of the ponds is stunning, especially with the backdrop of the Andes. From there we drove to Moray, which many believe was an agricultural research station built by the Incas. As we hiked down the hill toward the huge concentric circle terraces, I realized that they are far larger than they seem in photographs. Similar to walls we saw in Ireland, the stone terrace walls have occasional protruding stones which act as steps to go from one level to the next. Although the climb down to the bottom circle seemed like a good idea, the climb up was daunting. Not only is it steep, but the altitude quickly exhausted me. I was gasping for air by the time I got back to the top. 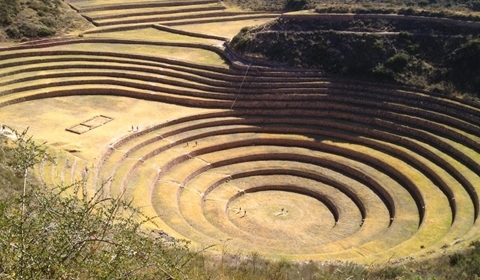 The agricultural terraces of Moray. For scale, each ring is approximately 6′ high. 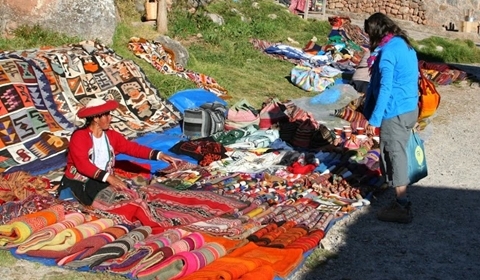 Next, our driver took us to the colorful craft and textile market in the town of Chinchero. Due to being rerouted around the town of Urubamba that morning, we almost arrived in Chinchero too late in the day. Some of the vendors were already packing up. This market is well known for its weavers and textiles. Although we talked to and bought from several merchants, one particular weaver was simply the most fun. She was explaining which weavings were made of Alpaca wool and others were either “cheap” or “sheep.” We weren’t sure which she was saying, but clearly she liked Alpaca better! We bought a gorgeous Alpaca hanging from her. At the end of the day, we zoomed back down into the Sacred Valley to our “home” in Ollantaytambo. I fell asleep extra early, attributing my exhaustion to the long and busy day. Unfortunately, when Dan and I woke up the next morning, we were sick. Splitting headache? Yes. Nausea? Yes. Lack of energy? Definitely. No desire to eat? Yep. Dizziness? Absolutely. Soroche, altitude sickness. Ugh. Day six? Lost to sleep and nausea. Word to the wise: pay attention to the altitudes! 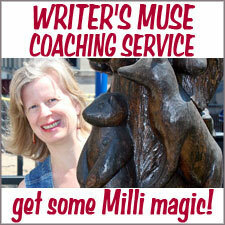 Lisa White has wandered through world like she has wandered through professions. 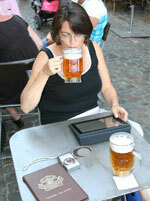 In both pursuits, she always has more to explore, more to learn, and more to do. Currently she practices law in the area of dependency and neglect as well as other cases that address the well-being of children. Often this is an area of law that feels exceptionally “heavy.” When it becomes too emotionally burdensome, she catches a flight somewhere—anywhere—to remember the good, positive, beautiful, tasty, and fun of the world.